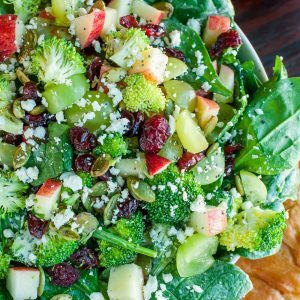 This colorful Apple Cranberry Spinach Salad with Broccoli and Feta is crisp, refreshing, and the perfect blend of savory sweet to enjoy all Fall and Winter long! I need to start hiding my apples. Nestled in a wooden bowl, rests a week’s wroth of apples. Colorful and piled high in a mountain of healthy goodness, each with a teeny tiny bite taken out of the center…. My toddler has managed to, without me knowing, take a bite out of every single apple in the bunch. I don’t know whether I should be angry or impressed, because her OCD tendencies really shine with this one. Granted if you placed a bowl of cookies on the counter I might be tempted to do the very same thing. Well played, chickpea. Well played. 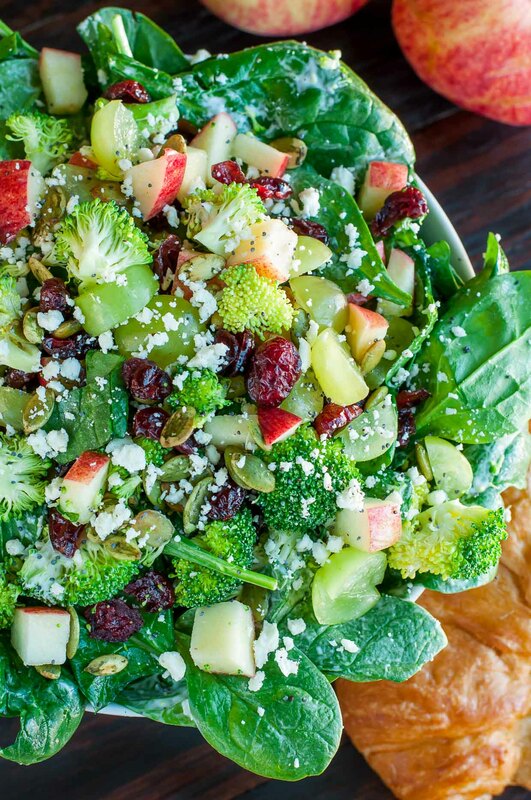 Empty your crisper and jazz up your cold weather eats with this sensational salad recipe! As always salad measurements are just a guideline, dive into that crisper and use up what you have, adding extra of your favorites as desired. Have fun with it and eat. yo. veggies. 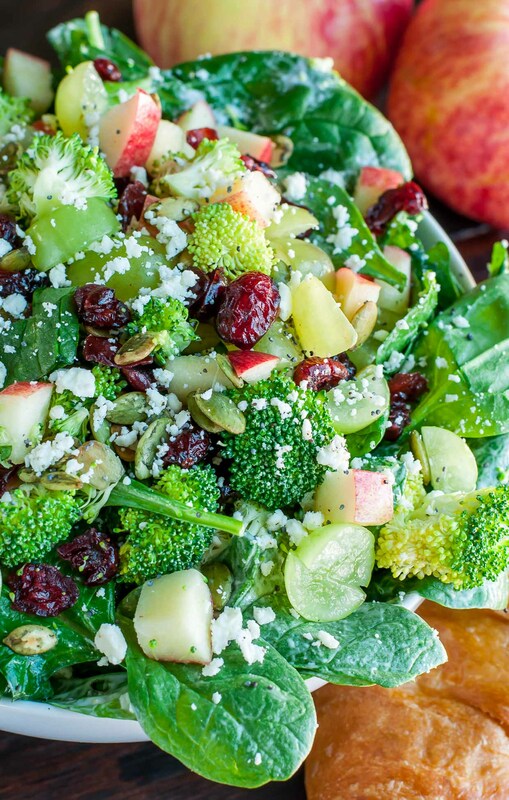 Combine with broccoli, apples, grapes, dried cranberries, feta cheese, and pepitas. Season with black pepper, to taste. Feel free to sprinkle with extra poppy seeds to garnish. Enjoy! This recipe yields about 2 large salads or 4 side salads! Making extra dressing for later? Typical food safety rule of thumb is that homemade dressings will keep in the fridge for 4 days. I tossed my salad with a homemade poppy seed ranch dressing, but feel free to use a premade salad dressing or your favorite homemade dressing recipe! Anything goes when it comes to dressing your veggies. Follow your taste buds and have fun with it! My super healthy Maple Citrus Dressing is also STELLAR with this seasonal salad! As for toppings, sunflower seeds make another great addition. Goat cheese may be subbed for feta if desired or the cheese can be skipped entirely and an extra protein may be added in the form of these tasty 5 minute candied walnuts or pecans. Cranberry Quinoa Salad with Candied Walnuts — reader favorite! Just made this last night and ate it today…it is a keeper!! The dressing was amazing. Gorgeous Salad Jen! Your toddler is a little turkey, thank goodness they are so dang adorable at this age, Taking one bite out of each of your apples…LOL Great clean out the refrigerator recipe! Sharing and pinning! 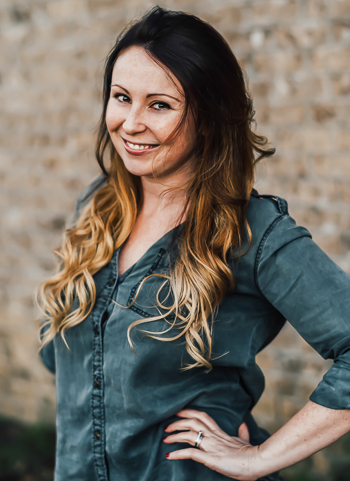 Thank you so much Bobbi! Haha and yes the cuteness is totally a defense mechanism in their favor when they’re little and crazypants like this!